Seldom has a joint programme between aid agencies made such a personal impression on an employee, but the partnership of ACT Alliance and Caritas—Protestants and Catholics helping Darfur–struck a cord with an aid worker in the region. Here, he describes why he likes his nickname. My real first name is Abakar. But everyone calls me “Actcaritas.” I like it. When I go to the camps for displaced people, they all call me “Actcaritas.” My real name is lost. I am logistics fleet assistant. I buy diesel in the market and take it to the camps. We use it to run the water systems, so the people have water. We used to need 30 drums of fuel for all the camps. Now that the programme has built solar-powered water stations, we use less fuel. 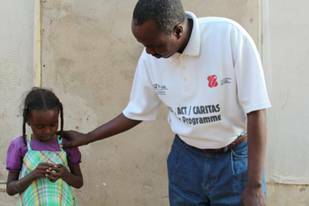 ACT/Caritas has supported NCA [Norwegian Church Aid] for a long time in Darfur. There were always very strong here. And they gave us a holiday bonus. ACT/Caritas is a quality donor. My shirt has the ACT and Caritas logos. Any day I wear this shirt, I am happy. But this shirt is wearing out. It’s been five years. This girl is my relative. Her mother calls her only by her nickname: Condoleezza Rice.